Office space prices ranging from $745 - $830 per month. 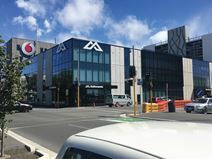 In the heart of the innovation precinct of Christchurch, this brand new building is surrounded by great places to shop, eat and drink, while vibrant Latimer Square is just up the road. Join a community of start-ups, designers and entrepreneurs who choose to take advantage of this centre"s nooks for quiet working, pods for focus, traditional hot-desking and places to create, ideate, present and meet. This space offers members access to a variety of office options including private spaces and coworking areas, all available on flexible terms. Strategically located in Christchurch Central, this space is ideal for public transport links - Addington Railway Station is less than a 10 minute drive away. You can benefit from assistance with your day-to-day business life thanks to the friendly and professional on-site management team. Situated in the architecturally designed Hazeldean Business Park, this space is just 20 minutes walk from Christchurch central business district. Right on the fringe of Christchurch Central, this space benefits from an abundance of natural lighting and business lounges - well-designed and perfectly styled to make the space as comfortable as possible. The area surrounding the centre is filled with various parking structures, to help make your daily commute a breeze.